The Decline of atheism is a religious phenomenon observed in many countries by many noted sociologists. 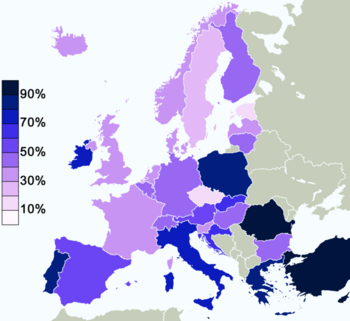 Atheism as a publicly accepted ideology in Europe and America is in decline, and has been for some time. In China particularly, Christianity is replacing (often nominal) atheism at an extraordinary pace. In Europe, however, these scholars argue that the trend is not toward a "Re-Christianization" of Europe, but rather toward a "Re-Paganization." The decline of atheism as a public opinion and a religion ought to be contrasted with the rise of atheism as a political force and among the powerful elite, and it does not necessarily reflect the influence of atheism overall. According to Munich theologian Wolfhart Pannenberg, "Atheism as a theoretical position is in decline worldwide." The origin of life (abiogenesis) has always provided something of a challenge for atheism. To date, life has never, under any circumstances, been observed spontaneously arising from non-life. Further, as the study of biology progresses, scientists and the public at large are becoming ever more aware of the profound complexity, intricacy and beauty evident in even the simplest forms of life. It was detail at this level, specifically the fact that a single cell can contain more information than the entire Encyclopedia Britannica, that convinced the well known atheist Anthony Flew that atheism was indefensible, and caused him to convert to deism. Another traditional bastion of atheism has been the belief that religion is a form of psychological pathology. This view was promoted by Freud, and more recently by R. Stark & W. S. Bainbridge in their work, Theory of Religion. The traditional argument was that religion was both the result of neurosis, and the cause of further deterioration into neurosis. Some challenge Prof. Vitz's argument that the temperament of an atheist arises from a strained relationship with his father, without addressing the possibility that both the atheism and the strained paternal relationship may have stemmed from the child's native cantankerous and rebellious temperament. As a result of these facts, many have become convinced that religion is psychologically beneficial, and that it is atheism which is both a cause and a result of mental illness. Another example of the decline of atheism in intellectual thought is that atheistic Marxist-Leninist has been in rapid decline throughout the world as a whole. The decline of atheism as an ideology in the intellectual arena can be also be seen in astronomy. The idea that earth and the universe are rare and remarkable in their ability to support life is increasingly being recognized — consider the ideas associated with the anthropic principle of the universe. Also, in astronomy the idea that the universe had a beginning and is not eternal has increasingly been recognized (increasing entropy of the universe, etc.). As a result of atheism's losing its intellectual lustre, Alister McGrath, a professor of historical theology at Oxford University, wrote in Christianity Today that atheism's "future seems increasingly to lie in the private beliefs of individuals rather than in the great public domain it once regarded as its habitat". "Crick is also a fervent atheistic materialist, who propounds the particle story. In his autobiography, Crick says very candidly biologists must remind themselves daily that what they study was not created, it evolved; it was not designed, it evolved. Why do they have to remind themselves of that? Because otherwise, the facts which are staring them in the face and trying to get their attention might break through." These are notable examples because, if this is what goes in the minds of the most vocal proponents of atheism, it certainly raises questions for those individuals who are less ardent advocates of atheism. According to Alistair McGrath in Christianity Today, "With time, [atheism] turned out to have just as many frauds, psychopaths and careerists as religion does. ... With Stalin and Madalyn Murray O'Hair, atheism seems to have ended up mimicking the vices of the Spanish Inquisition and the worst televangelists, respectively,"
Christianity is growing in former atheistic strongholds like the former Soviet Union and China. Currently, Christianity is growing very quickly in China. According to Christianity Today, at a conservative estimate there are currently about 70 million Christians in China out of 1.3 billion Chinese. According to David Aikman, former Beijing Bureau chief for Time magazine, former PRC President Jiang Zemen has identified Christianity as the secret of the West’s success, and he wants to bring such success to the Chinese people. Mr. Aikman predicts that as many as 1/3 of the Chinese will convert to Christianity within the next generation. Of course, the transformation of China into being a more Christian country may affect other nations in Asia and thus convert more professed atheists. The world is obviously a far smaller place now and it seems that the areas of the world where atheism and secularism have their greatest strength are in decline. For example, economic and political commentator Robert J. Samuelson wrote a very compelling article called The End of Europe where he argues that European influence in the world will decline. In an increasingly global community, of course, this is not good news for European atheism, which is likely to have less influence on the world. In addition, conservative Christianity, which is certainly evangelistic and asserting itself in the world's public intellectual arena, is growing in the USA and especially in the Third World. (For the growth of conservative Christianity in the USA, see the book Exodus: Why Americans are Fleeing Liberal Churches for Conservative Christianity by Dave Shiflett). Since, generally speaking, liberal theologians are more likely to embrace materialist ideas, such as macroevolution, this of course means that fewer Christians are likely to support these ideas, which will reduce the influence of atheism. Penn State professor Philip Jenkins, author of The Next Christendom: The Coming of Global Christianity, has also pointed out that Christians living in Africa, Latin America, and parts of Asia are far more conservative theologically than Christians who live in the West, so one would expect they would be less likely to adopt or embrace materialist and atheist macroevolutionary ideas. Of course, in a world community, this is important especially since Third World countries are having more and more influence. The Godlessness that Failed by Michael Novak, First Things 104 (June/July 2000): 35-39. Some Atheistic Arguments Answered by Wayne Jackson, M.A. Putting The Atheist on The Defensive, Parts One and Two by Kenneth R. Samples Christian Research Journal, Fall 1991. This page was last modified on 9 July 2014, at 00:43.